The legality of a U.S.-led coalition using white phosphorus is sort of a gray area. 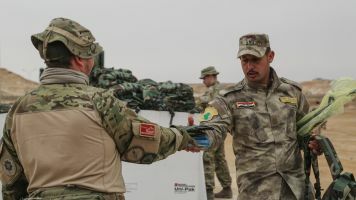 A human rights organization is concerned about the U.S.-led coalition's reported use of a controversial munition in highly populated areas in the Middle East. It's called white phosphorus. U.S. officials say its primarily used to camouflage troop movement and mark targets. But it also can create an incendiary chemical reaction that can kill a person if it contacts their skin. The Washington Post reported that a photo taken in March of U.S. Marines in Syria had a pallet of white phosphorus munitions. The use of white phosphorus is kind of a gray area. The substance itself isn't banned under the Chemical Weapons Convention. A New Zealand military official told NPR the coalition used it for smoke screens to help civilians safely get out of Mosul, Iraq. That's considered a legal use of the material. But it's prohibited if it's used specifically as a chemical weapon. A spokesman for the U.S.-led forces also says the munitions are used in lawful ways, but recent news articles say white phosphorus was used in the Syrian city of Raqqa, where the United Nations estimates as many as 100,000 civilians still live. Because of its harmful effects, Human Rights Watch said Wednesday that U.S.-led forces need to be careful about using the substance in highly populated areas. "This latest use of white phosphorus underscores the urgent need for states to strengthen international law relating to incendiary weapons," said Stephen Goose, arms director at Human Rights Watch.